This is a series of articles celebrating our volunteers and all the work they do for, and with, Historic Rugby! We are very fortunate to have extremely talented actors, singers and musicians who live in Rugby and the surrounding tri-county area. 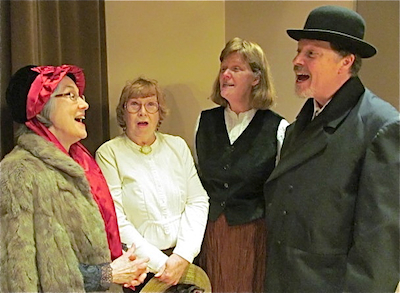 In recent years their talents have been showcased in two different plays, during holiday events like Ghostly Gathering and Christmas at Rugby, and the ongoing Lantern Tour. The Lantern Tour is a theatrical event that takes place in the Laurel Dale Cemetery and features actors depicting residents from Rugby’s founding as a colony and onwards. This popular tour was originally created by resident Mike Harris and developed with other community members in 2010. It is based on the work Mike did in bringing the Cemetery Tour to the Stones River Battlefield in Murfreesboro when he worked there as a college student. 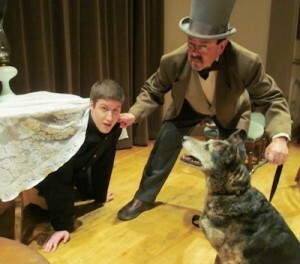 In this article, Mike Harris and George Zepp, two of the many volunteers who help with interpretive programming in Rugby, tell us about a special new program “Entertainment at Commissary Hall” which will be performed at the Rebecca Johnson Theatre on Saturday, April 12. George and Mike began doing research in Historic Rugby’s archives and they found some fairly detailed programs listed for several events presented by the Rugby Social Club. An article in an 1881 issue of the Rugbeian told of one of their programs given on December 27th. “It detailed the exact music, readings and drama that were used” Mike says, adding that by doing a little more digging,“We were able to find the readings and music they actually performed then”. Benita Howell helped by going through stacks of sheet music that once belonged to Sadie Walton. That’s where they found the music for “ Grandmother’s Birthday”. “The internet helped a lot with finding some of the more obscure musical numbers. We also were able to get some of our projected images that way from original sources.” says George. The double quartet includes: Bethany and Ron Jackson, Tom and Benita Howell, Linda Konig, Mary Hemminger, Bob Trumbo, and Mike Harris. They will be singing songs last performed over one hundred years ago including “Gathering Up the Shells from the Seashore”, The Midshipmite”, and Grandmother’s Birthday”! The featured musicians are Judy Newport, who will be accompanying the singers on piano, and Tom Howell who will be playing the very difficult classical pieces. Jenny Hubbard Young will provide the narration for the event. 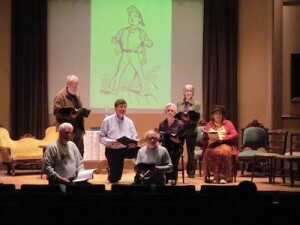 Actors who will pantomime a wonderful, old work called “Sarah’s Young Man” include Kellie Cooper-King, George Zepp, Kevin Harris, and Austin Lowe. Wendy Whitten and Zach Langley will tell a brutal murder story well known by those in the old country called Eugene Aram’s Dream. 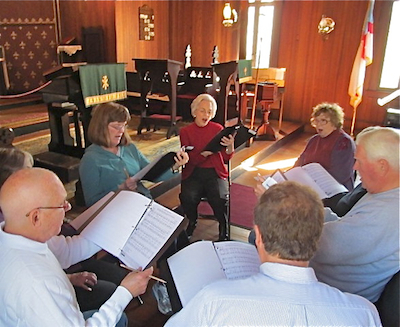 Asked for any additional comments, George Zepp remarks “ Early rehearsals were in Rugby’s Christ Church Episcopal, where the aged wood makes singers resonate. I was blown away at the first rehearsal with how good Rugby’s own vocalists sounded (many of them church members), before even practicing. We’ve moved the production to the Rebecca Johnson Theatre to seat more people, but the level of expertise and quality has carried over quite well in later run-throughs”. We are so fortunate to have such accomplished actors, singers and musicians who volunteer their many talents to the interpretive programming that Historic Rugby does so very well! We want to take this opportunity to also thank those not mentioned in this article for their contributions to other interpretive events we’ve had. Where else but Rugby can you be entertained with such original programming as “Entertainment at Commissary Hall”? Come by and check out our new, exciting event! “Entertainment at Commissary Hall” will be performed on Saturday, April 12 at 7:30 p.m. EDT at the Rebecca Johnson Theatre in Historic Rugby’s Visitor Centre.